Right now my '4 has just over 9,000 miles on it and the there is already a discernible lip on the edge of the discs so the writing is already on the proverbial wall - this will be needing discs and pads by the 2nd service unless I take action soon. Maybe others have less wear - this was a Press car so will have definitely have had a rough 1st 6,000 miles. Yellow is better than red in all eventualities, Cold hot or moving slowly. We have only listed red on the A8 because these are more luxury type vehicles and maybe most drivers would like the lack of brake dust relative to the yellow on these cars. No Porsche uses this latest Audi pad as far as we know so far"
Bottom line - all these models share the same pad, so effectively are available in Redstuff & Yellowstuff. " So I have ordered front and rears from the EBC Shop in the UK at a fraction over £171 delivered - I'll organise getting them fitted next week and feed back on the results. Thanks - they look gorgeous TX...I'm afraid to ask the investment required! RS4John wrote: Thanks - they look gorgeous TX...I'm afraid to ask the investment required! Ha ha don't ask! I hate the brakes on the RS's, real shame that Audi don't offer factory upgrades^. 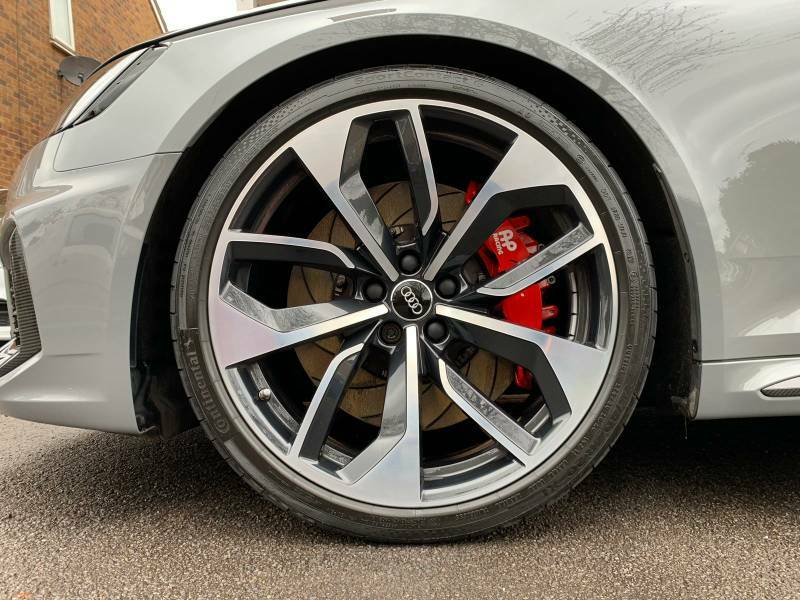 I kind of know what you mean re the stock brakes - the previous ride had the wavy discs and 8 pot callipers and still ranks as the best road car stoppers I've ever used. I'm sure I read somewhere that Audi found them in the RS6 parts bin. I ought to keep an eye on Ebay and see if I could buy a pair to offer up. I'm hopeful the Redstuffs will help towards improving the stopping ability - it's not like there are 'bad', just not as good as they could be. You may as well cut 4 pieces of wood to shape paint them red, go to you local engineers and get some mild steel disks made up and fit them, they'd probably perform better than EBC. Clearly speaking from experience then Covkiller? For the record it's an £80k car though I didn't pay anything even remotely close to that... I do like the RS4 B7...never driven one though, had a couple of B7 Cabs though. Yes I once had EBC red stuff pads on my 2.8i Special Capri to my shame (fell for the advertising) and threw them away after a couple of drives, complete sh1t. Since then owning a Cosworth, E36 M3, Porsche 911, C63 AMG, two RS4's and another E36 M3 I would only recomend fitting quality products, such as the grey RS4 B9 above dressed in AP racing. I have no issues or complaints with my brakes. Maybe consider a ceramic upgrade? Stops on a dime and keeps stopping. I would not touch EBC with a barge pole - and yes I have tried them, albeit on track and not on an Audi. But then I am used to Performance Friction for track work - dusty but very good - and, to be fair, others I have met (not many in my experience) do rate EBC. Look on forums, they get a mixed review. I actually think the standard brakes are good and wouldn't mess with them but each to their own. Yeah - balanced view, I've used them before and been very happy, they do come with an abrasive coating now which assists in the bedding in process. Going back 20+ years - Greenstuffs on Saab 900 Turbos...pads used to fall off the backing plates, added a new level of excitement. And yes you find very mixed reviews on the forums. The attraction now is OEM or slightly better performance, negligible disc wear and dust. I'll report back once fitted and bedded in. Have covered about 250 miles with the Redstuffs in - as with the previous RSQ3 the initial 'bite' is noticeably more assertive now. The pads have an abrasive compound which is intended to assists with the bedding in process and of course really dusty wheels as a result. So fa so good. So now the Redstuffs are fully bedded in - just moved the car out of the garage to share a picture with a mate of last weekend's efforts of tiling the garage floor. Check the RS wheel out, that's after 200 miles, almost no brake dust! The Galaxy S10's camera is good...the sensor has picked up the falling rain..